Sometimes called a wreck of car accident, an accident is when a vehicle unintentionally collides with another vehicle, object, or person. Accidental death coverage provides payment to the insured’s designated beneficiary in the event that someone who is covered on that auto insurance policy dies from accident-related injuries. This coverage may be part of your auto insurance policy’s personal injury protection (PIP) coverage. Actual cash value (ACV) is the fair market value of your property. The actual cash value of your vehicle is determined by subtracting your vehicle’s depreciation from its original cost, which equals its replacement cost. An actuary is a person who calculates the financial impact that the risk of an uncertainty can have on a company. Actuaries help keep Elephant financially stable and profitable by setting prices and determining how much to hold in reserve to pay claims. Additional interest insured refers to another person or entity listed on a policyholder’s auto insurance policy, which provides them protection under the policy. For example, if you are currently leasing your vehicle, you may be required to list your leasing company as an additional interest insured to protect the company in the event of any future accidents or lawsuits. A term often used to refer to the other party’s insurance company. An agent, or insurance agent, sells insurance coverage to customers like you. They also help to manage your policy in the event you have a question or need to make a change, like adding additional coverage. An alteration to the basic policy contract. This is not to be confused with an endorsement, which adds to a policy. Amendments are changes to your policy typically initiated by the company. For example, if state laws change and increase the required bodily injury limits, the insurance company may process an amendment to your policy to match the changes. Antitheft recovery systems consist of concealed electronic devices installed in your vehicle. In the event your vehicle is stolen, this device may be activated and emit a signal that is used to locate your vehicle. Drivers of vehicles with antitheft recovery systems installed may qualify for a discount on their auto insurance policy. The Antique Automobile Club of America defines antique cars as any vehicle more than 45 years old. A process, performed by an impartial expert, that determines the value of property, or the extent of damage to the property. A process of settling a dispute outside the courts through an impartial party, wherein the resolution is agreed to be bound. A driver who does not qualify for insurance in the regular market. He or she must get coverage through a state assigned risk plan which specifies that each insurance company must provide policies for a proportionate share of these drivers. The party that is legally liable for the damages incurred through an accident. Provides protection from losses to the insured’s property and losses for which the insured is liable as a result of owning or operating an auto. The theft of an auto is covered under comprehensive coverage. The amount paid by an auto insurance company to you or any listed beneficiary when you file an auto insurance claim. A temporary agreement declaring that the policy is immediately effective. An injury or illness resulting from a person. Pays damages for bodily injury or death resulting from a car accident for which you are at fault and provides you with a legal defense. This coverage is subject to the terms, limits and conditions in your policy contract. A body shop, or repair shop, is a business dedicated to repairing vehicles that employs mechanics, as well as other automotive experts, who are able to offer a range of vehicle repair services. A broker, or insurance broker, is an independent insurance professional who helps customers obtain auto insurance coverage that fits their unique requirements. Brokers compare multiple insurance companies’ rates to select the best policy. Bundling is the process of combining multiple types of insurance coverage from the same company. Common bundling includes both auto and home insurance, providing, in most cases, a discount to the policyholder. Comprehensive Loss Underwriting Exchange (CLUE) report provides claim history information. The termination of an insurance contract before the end of the policy period, either by the insured or insurer. A disaster affecting a specific geographic area that often causes injuries and extensive property damage. Hurricanes, tornadoes and floods are examples of catastrophes. Citations, or tickets, are legal summons that are usually issued as the result of a moving or non-moving driving violation. A request for payment from the insurance company based on the terms of the insurance policy. A person, employed by the insurance company, responsible for investigating and settling a claim. Person or entity presenting a claim. The Classic Car Club of America defines classic cars as any vehicle between 20 and 45 years old. Collector car insurance is protection for those vehicles that are not used as your primary vehicle, but instead are used in car shows, selective afternoon drives, and other special events. Antique, limited-edition, exotic, or military grade vehicles can all be classified as collector cars. Pays for damages to an insured car when it hits or is hit by another car or object. This coverage is subject to the terms, limits and conditions of your policy contract. A principle of law that, in some states, may enable claimants to recover a portion of their damages even if they are partially at fault, or negligent. Each party’s negligence is compared to the other’s and a claimant’s recovery can be reduced by the percentage of his or her own negligence. Parts made by a company other than the manufacturer of the auto. All parts Elephant authorize meet or exceed the quality of the equivalent manufacturer’s parts, but cost less. We will guarantee these parts for as long as you own the car. The consideration of multiple repair estimates. Pays for damages to your vehicle from vandalism, theft, flood, fire or other covered perils. This coverage is subject to the terms, limits and conditions of your policy contract. The section of the insurance contract that lists the duties and responsibilities of both the insured and the insurance company following a loss. Insurance coverage from an insurer that was in effect at all times, without a break or lapse in coverage for any reason. A principle of law that, in some states, may prevent claimants from recovering any portion of their damages if they are partially at fault, or negligent. Protection and benefits provided by the insurance company in the insurance contract. Credit score is the numerical value that signifies the likelihood an individual will repay a loan or other debt on time. Higher credit scores typically have a better chance of being approved for loans, vehicle financing, and credit cards. Your bill payment history, credit history, debt-to-credit ratio, as well as other financial details can positively or negatively impact your credit score. Customized parts and equipment coverage (CPE) provides protection in the event of a loss to nonstandard parts that have been permanently installed after your vehicle’s original production. For example, adding an upgraded car stereo, modified exhaust, upgraded security system, or even new wheels would all be considered customized parts and equipment and may be eligible for additional coverage. Loss or harm to a person or property. Money that one party is legally obligated to pay to another party. The portion of a claim that is not covered by the insurance provider. It is the amount you pay out of pocket before the insurance company will cover any expenses. Choosing a higher deductible will lower your insurance premiums. The reduction in value of a property due to usage, time, wear and tear, technological out-dating, depletion, inadequacy, rust, decay or other such factors. Generally, depreciation is not an insurable loss. Direct auto insurance, or online insurance, provides the customer with the convenience of purchasing auto insurance coverage directly through a company’s website or over the phone with a licensed insurance agent. A reduction in your premium if you or your car meets certain conditions that are likely to reduce the insurer’s losses and expenses. Elephant gives discounts for clean driving records, good students, multiple cars, and paperless accounts. The effective date is the date your auto insurance coverage begins. It is important to remember that you are not covered by an auto insurance policy until the effective date. EFT is an electronic payment method that lets you make your premium payments with automatic deductions from your bank account. An addition to the basic policy contract. An assessment of the cost to repair your damaged vehicle. Excluded drivers are individuals who are specifically listed on your auto insurance policy as someone who is not covered. For example, your spouse may have a poor driving record and so the two of you have separate auto insurance policies. You may list their name as an excluded driver meaning that they will not be covered under your policy if they driver your vehicle. Restrictions in your insurance policy that limits or excludes coverage for certain perils, property, or locations. The date that your policy coverage runs out and your renewal policy will start. This date can be found on your declarations page. In auto insurance, a family member is a person who lives in the same home as the policyholder and is related by blood, marriage, or another recognized connection such as adoption, or foster care. In some cases a child who is a student living away from their home may still be considered a family member. A minor, low impact car accident in which the front or rear of your vehicle suffers damage. In most cases, fender benders occur when a driver brakes unexpectedly and the following vehicle is unable to stop. Although startling, fender benders typically cause negligible damage. A car that has been financed by a loan. The lender retains a lien on the auto until it has been paid off. Financial responsibility when referring to auto insurance indicates that you have the financial support needed to pay for damages you may cause in the event of an accident. In most states, purchasing an auto insurance policy with the necessary liability coverage demonstrates your financial responsibility. Term used to refer to the insured. A claim made for damages, loss or injury made by an insured. FR-19, or Maryland insurance certification, is a form that Maryland drivers may need to sign when registering their vehicle acknowledging that they will carry the states required minimum liability coverage. Full coverage car insurance implies that the policyholder is carrying coverage beyond liability coverage. “Full coverage” is not an actual insurance coverage, but instead a term that people often use when describing the amount of auto insurance coverage they carry. Garaging location refers to where an insured vehicle is parked the majority of the time. Most commonly the ZIP Code for your primary residence indicates your specific garaging location and may have an impact on your auto insurance rates. You will want to notify your insurance company if you keep your vehicle garaged in a location other than your home address. Anything that increases the chance of loss or an accident occurring. Homeowners insurance is a type of property and casualty insurance that covers the insured’s primary residence. Homeowners insurance typically provides coverage for liability, personal property, as well as damage to the primary structure and other structures like a detached garage or storage building on the property. Remember, the policy holder must be in the process of paying off their mortgage or own their home to qualify for homeowners insurance. If you currently pay rent on your residence, you may select additional renters insurance, which is coverage that protects your personal property in the event of a loss. Income loss coverage provides financial protection if you are unable to work due to an accident-related injury. If you are involved in an automobile accident and had to be hospitalized for a week, your income loss coverage helps you recover a portion of your lost salary while you try to return to work. The act of providing payment for a loss with the intent to restore an individual to the approximate financial position prior to the loss. Compensation for a loss intended to restore an individual or entity to the approximate financial position prior to the loss. Forms of indemnity include cash payments, repairs, replacement, and reinstatement. An individual who estimates losses on behalf of an insurance company, but is not an employee of that company. Confirmation of a car’s physical condition. Exists when an individual would suffer a financial loss as the result of damage to property or bodily injury. For example, damage to your vehicle would cause you to suffer financial loss, but damage to your co-worker’s vehicle would not personally cause you any type of loss (it would be your co-worker’s insurable interest). Insurance is a system in which groups of people who have similar chances of suffering a loss transfer their risk of loss to an insurer who pools the risk of many people together. In exchange for payment of premium, the insurer promises compensation for specific potential future losses. An insurance card, or ID card, lists your auto insurance policy’s important information. Your insurance ID card will list all names and addresses of the policyholder(s); policy number; vehicle information including the year, make, model, and VIN; policy effective date, as well as your insurance company’s name and contact information. An insurance claim report contains details about auto insurance claims you or another insured driver listed on your policy have filed with their insurance companies, both previous and current. Independent consumer reporting agencies like C.L.U.E., the Comprehensive Loss Underwriting Exchange, collect car insurance claim information from a variety of insurance companies to compile these reports. The act of falsifying the facts of an accident to an insurance company to obtain payment that would not otherwise be made. Common types of insurance fraud are staged accidents, exaggerated injuries, and inflated medical bills. Insurance scores are determined by analytical models that take objective measurements on the relative likelihood of future insurance losses based on aspects from your credit history. Independent consumer reporting agencies provide these scores, as well as their analyses. An individual or organization covered by an insurance policy. An organization that provides insurance. A judgment is a final decision rendered by a court of law. Lapsed coverage refers to a period of time when an individual is without an active auto insurance policy. Having a lapse in your auto insurance coverage can suggest to insurers that you are a higher risk and can often result in higher premiums in the future. Remember that driving without at least liability coverage is illegal in many states and can result in hefty tickets and fines. A vehicle rented under a long-term contract. The leasing company must be shown on your insurance policy as an insured. A lender is an individual or organization that provides financial loans. A lessee is a person who is leasing property, usually a vehicle or home. Any legally enforceable obligation for the injury or damage suffered by another person. The liability adjuster handles the investigation of the accident. These adjusters’ responsibilities can include collision payments, property damage payments, and bodily injury settlements. In some states, these adjusters may also handle the medical portion of your claim. A claim on property as a security for the payment of a debt. A person or organization with a financial interest in property up to the amount of money borrowed or still owed on the property. The maximum amount an insurance company will pay for damages or injuries that apply to the coverage. Most states have laws that specify the minimum limit that must be purchased for each required insurance coverage. The amount named in your policy up to which the insurance company will protect you. An instance or measurable cost of damage and/or injury suffered made by an insurance policyholder. Compensation to a third-party claimant for financial losses resulting from the inability to use the property as the result of accident-related damage. Intentional damage of personal property with malice of planning. Optional coverage that pays medical expenses related to an automobile accident. This coverage is subject to the terms, limits and conditions of your policy. Inaccurate or deliberately false representation of the nature of somebody or something. Motorcycle insurance provides protection for your motorcycle and yourself in the event of an accident. A moving violation is an unlawful, driving-related act committed while your vehicle is in motion. For example, if a police officer pulls you over and writes you a ticket for speeding, improper signaling, running a red light or stop sign, or even following too closely, these would all be considered moving violations. Available to policyholders who insure more than one vehicle at the same location. The person or entity stated on the policy declarations page. A civil wrong causing injury or harm to another person or property as the result of doing something or failing to provide a proper or reasonable level of care. A non-moving violation is a legality-related citation a vehicle owner may receive due to expired registration, parking violations, or other violations not related to the operation of your vehicle. When a party decides not to renew a policy at the end of its policy period. An event or repeated exposure to conditions, which unexpectedly causes injury or damage. Auto parts acquired from the original manufacturer of the car or supplier of the original part. Out-of-pocket expenses refer to what you pay in addition to what your auto insurance company pays when you file a claim. Typically your out-of-pocket expenses result from you satisfying your policy’s deductible and coverage limits. For example, if you carry property damage liability coverage with a limit of $25,000 and you are involved in an accident for which you were found at-fault that caused $30,000 worth of damage to the other person’s property, you could incur out-of-pocket expenses of $5,000, as well as your deductible. A passenger safety system, such as an air-bag, that activates automatically and instantaneously in the event of an accident. The Payment Recovery Adjuster is responsible for recovering your deductible from the other party’s insurance company. A danger or hazard that can cause a loss. Permissive use describes the act of granting another person permission to drive your vehicle. If you grant another person permission to drive your vehicle and that person is involved in an accident while driving your vehicle, your insurance company typically will provide the same coverage to that driver that they provide to you. There are some exceptions though: some states only grant reduced coverage to permissive drivers. May pay for your medical treatment, lost wages, or other accident-related expenses regardless of who caused the accident. This coverage is subject to the terms, limits and conditions of your policy contract and is not available in all states. Personal liability describes an event in which a person is legally responsible for damages caused to another person or property. If a person is found personally liable, they are financially responsible to compensate the injured party for damages in accordance with their state and the nation’s liability laws. Tangible movable property, exclusive of land and including items such as automotive vehicles, boats, and money. When talking about auto insurance, pleasure use describes a vehicle owner who drives their vehicle for fun the majority of the time, with little to no commuting to work or other commercial use of the vehicle. A contract between you, the insured, and the insurance company. Any change made to your insurance policy during the period that the policy is active. The policy term is the length of time your auto insurance policy is valid. 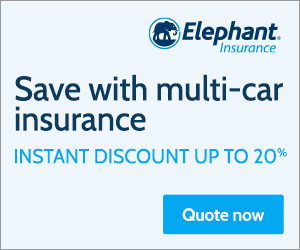 Elephant Auto Insurance policies have a policy term of 12 months, guaranteeing your low rate and great savings for a full year. The named person or entity listed on the policy declarations page, who has purchased the insurance policy. The state and condition of the vehicle prior to the accident, including damage not related to the accident, mileage, options, and other factors. The fee of the insurance policy that the insured pays in exchange for insurance coverage. The primary driver is the person listed on an auto insurance policy who drives a specific vehicle most often. A primary residence is the home address and ZIP Code you list on your auto insurance policy as your place of residence. Unless you garage your vehicle elsewhere, your primary residence and garaging location will be the same. Proof of insurance is any signed, legal document that your auto insurance company has provided you that lists your active policy’s effective date. A statement made regarding the scope of the claim; it may be requested in accordance with the conditions of the policy. Property and casualty insurance, or P&C insurance, provides financial protection for your vehicle, as well as your home, condo, business, and any other asset against loss and damages. An easy way to remember how this type of insurance works to protect you is that property insurance protects your property itself, while casualty insurance protects you against legal liabilities caused by damages to another person or their property. Pays for damage to someone else’s property resulting from an accident for which you, the insured, are at fault. This coverage is subject to the terms, limits and conditions of your policy contract. An act or omission initiating a continuous sequence of events resulting in bodily injury or property damage. A report of the premium that will be charged for insurance coverages based on precise information provided by the individual requesting the quote including drivers, vehicles, and driving record. Often used as a synonym for premium but in fact refers to the base rating units that are used to determine the final premium. The system that determines your insurance premium rate. These rules change the base rates by applying discounts and surcharges based on your personal uniqueness, for example, using your seat belt, having anti-lock brakes, and insuring more than one vehicle. Registration, or vehicle registration, refers to the required act in which vehicle owners file official documents on their vehicle with a governing agency, like their state’s Department of Motor Vehicles. Remember, it is illegal to drive or operate a vehicle that is not legally registered with your state. A review of an estimate or appraisal done by an adjuster during or after repairs to a vehicle. This is done to guarantee the accuracy of staff or independent auto damage personnel, and to guarantee that the work required in an estimate or appraisal is being completed by the body shop. Legally binding contract stating that all obligations, arising from a particular accident or occurrence, have been fulfilled. The date your insurance policy expires, and the date your renewed policy will begin. A renewal letter is a form that your auto insurance company sends to you the policyholder before your active auto insurance policy expires. This letter outlines your next policy’s terms, like its effective date, expiration date, as well as the policy’s premium. Renters insurance is coverage that protects you and your property from theft, liability, vandalism, and other damages caused by natural disasters and/or fires. Optional coverage that helps pay rental vehicle expenses when your insured vehicle is inoperative as the result of an accident or loss. Available to most policyholders for an additional premium. Several types of parts may be used when your vehicle is repaired: new parts, original equipment manufacturer and after-market. New or after-market parts will be used if we can’t find similar-class parts. The chance of incurring a loss. An SR-22 (CFR) is a certificate mandated by the state to verify that an individual is maintaining auto insurance liability coverage. If a person needs an SR-22 (CFR), they will usually be notified by their state’s Motor Vehicle Department. A SR-26 is an insurance form filed with the state’s Department of Motor Vehicles by the insurance company indicating that the policyholder either no longer requires an SR-22 or the form has expired. Damaged property which is taken over by the insurance company after payment of a claim. Term used to refer to the insurance company. The secondary driver is an insured driver who due to their occasional use is not considered the vehicle’s primary driver. Individual who is employed by Elephant Insurance to handle claims. If your car is damaged because of another driver’s negligence and you ask Elephant to settle the claim for damage to your car, we will seek payment recovery from the other party. Used to cover damage not included in the original estimate. The unlawful act or crime of taking of someone else’s property with the intent to permanently deprive the owner of its use or possession. Claims for injury or damage to property of a third party (the claimant) alleged to have been caused by the first party (the insured). A private or civil wrongful act, other than breach of contract, for which damages can be sought by the injured party. Property that has sustained damage so massive that repairing it is not logical. A vehicle that is considered a total loss is if it cannot be repaired safely, if fixing the vehicle is not economically practical, or if state regulations require us to deem it a total loss. Underinsured motorist bodily injury coverage, or UMBI, is coverage that helps pay for medical expenses, lost wages, and other damages you may incur in the event you or your passengers are involved in an accident caused by a driver who does not carry sufficient auto insurance coverage. Usually, UMBI pays the difference between the at-fault drivers bodily injury coverage limits and those limits you have selected. Remember that UMBI only pays up to the limit you selected when you purchased your auto insurance policy and it is only available in certain states. Underinsured motorist property damage, or UMPD, is coverage that helps pay for your own property damage when the at-fault driver either does not carry sufficient coverage or has exceeded their liability limit. UMPD is mandatory is some states, optional in others, and may not apply to hit-and-run accidents. The process of assessing risk, by the insurer, to determine whether or not it will provide coverage for an applicant. The deliberate damage or destruction of someone else’s property. A 17-digit number assigned to each vehicle, and is used for identification purposes. A written guarantee of the integrity of a product and of the manufacturer’s responsibility for the repair or replacement of defective parts. This page is intended for informational purposes only. It does not replace or modify the information contained in your insurance policy.